Your Online Store product pages provide detailed information for each product, such as photos, price, SKU, category, a description, and video. Product pages can include videos from YouTube, Vimeo, Vine, Instagram, DailyMotion, or Youku. In your Online Store, from the Products menu, click Products. On the All Products page, click the name of the product page you want to edit. On the Description tab, click in the description where you want the video to appear. Click the video icon in the toolbar. When the video appears in the Description tab, click the play button to test it, and then click Save. Or, if you want to add another video, click Save and Add Another. 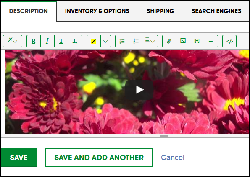 To see your change, click View Store at the top right of your product page. In your store, click Shop and then click the product page you changed. The video appears below the page's Add to Cart button.